Drone photography is taking off as a tool for selling and renting homes. 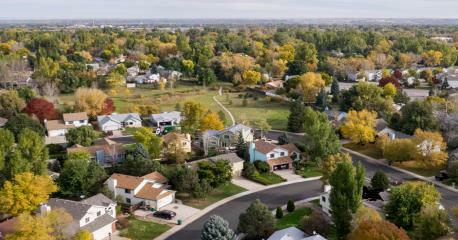 More than ever, real estate professionals rely on the unmanned flying machines to set their listings apart from the competition. Up until now, drone photos and videos frequently showed up on listings for mansions and properties in spectacular locations. But soon they’ll be showing up in listings for middle-class homes, too. Given today’s fierce real estate markets, some experts say drones are just the thing to rise above the competition. “Anytime you want to differentiate your property from the competition, drone is a dramatic eye-catching first impression that’s going to get people to look at your property first, as opposed to your competitors,” says Brian Balduf, CEO and co-founder of VHT Studios, a visual marketing firm. Balduf says home buyers are beginning to expect to see drone photos in beach communities as well as in scenic mountain areas in places like Colorado and Utah, where “it’s not so much about the house itself; it’s where the house sits.” Why, he asks, wouldn’t you want to show off how close your home is to the beach? If your home or property is unusual or unique, drones can provide a visual advantage that ground-level photos cannot. Gonzalez is the owner and founder of Drones Unlimited, which specializes in aerial photography, in Ocala, Florida. At least two or three times a month, out-of-state prospective buyers hire him to shoot photos and videos of properties they’re interested in. It’s a way for them “to see a piece of property without getting on a plane and going there.” He sends them the footage without meeting them in person. One time, Gonzalez was hired by a client who was in town but didn’t want to tour an 80-acre property on a humid, 90-degree day. “So instead of us walking that amount of acreage, we were actually flying the drone, and the client was looking at a live feed on a TV,” Gonzalez says. Gonzalez also has been hired by home inspectors who wanted to assess damage to a roof four stories high and by an owner of mobile home parks who wanted photos for damage assessments after Hurricane Irma. Homeowners might be surprised at how reasonable drone services can be. Balduf says drone photos are a little more expensive than traditional, on-the-ground photos. For most clients, drone photos cost between $200 and $500, he says. “Every job is case by case, so we have to quote them all out individually,” Gonzalez says. He might charge as little as $100 for a quick flight yielding 10 photos, to more than $1,000 to shoot a rambling horse farm (Ocala is in central Florida’s horse country). Preparing for a drone photography session is no different from preparing the inside of your home for traditional listing photos. Cleaning and decluttering is always the first step. A dirty roof will look distracting. Pool toys, backyard clutter and cars in the driveway should be moved or put away. Try to identify problems that are visible only from the air. October 26, 2015 admin Comments Off on Can You Still Get a Seller to Pay Your Closing Costs in Today’s Housing Market?